Joey Logano, Jimmie Johnson, Carl Edwards or Kyle Busch. One of those four would be the 2016 NASCAR Sprint Cup Series champion. Joey Logano wins the Can-Am 500 on Sunday at Phoenix International Raceway to earn a trip to the Homestead-Miami Speedway’s finale as one of four championship contenders, joining Martinsville winner Jimmie Johnson and Texas winner Carl Edwards. 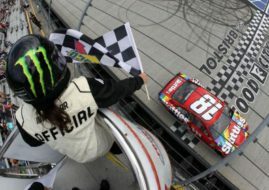 Defending champion Kyle Busch finished second at Phoenix, securing the fourth spot in the Championship 4 round. Joey Logano beat Busch to the finish line by 0.587 seconds in the second of two overtimes. For Logano, this is his first victory at Phoenix’s 1-mile track, his third win of the season and 17th Sprint Cup victory in a career. Four drivers who failed to advance from Round of 8 to the Championship 4 are Kevin Harvick, Kurt Busch, Denny Hamlin and Matt Kenseth. Harvick finished fourth at the PIR, but only a victory could put him into the final round. Kurt Busch was fifth, Denny Hamlin finished seventh. Matt Kenseth dropped out of the lead and finished 21st after an accident caused by his teammate Kyle Busch on Lap 317.